Bella Gaia: An iridescent landscape of gossamer melodies and labyrinthine rhythms, with a sense of celestial wonder. No matter how many times we've all heard it, it bears repeating: We have only one planet to call home. It's an extraordinarily beautiful planet, teeming with diverse life and vital natural resources, sustaining a great human civilization. But it's a planet that's crying out for help. The sooner we all realize that, and heed its call, the longer Earth will be our home. Kenji Williams is acutely aware of that reality, and Bella Gaia, the astoundingly moving multimedia presentation that he's envisioned and executed, is his way of helping to spread the message. Encompassing live music and dance, breathtaking film and timelapse photography, cutting-edge data visualizations produced by NASA supercomputers, Bella Gaia is at once both infinitely entertaining and a stimulating educational experience. The project warns us that human civilization threatens to destroy the very fabric of life upon which the habitability of the planet depends, while also reminding us of the deep creativity humanity possesses and which needs to be employed if we are to enjoy a viable future. It is an "Exploration of the relationship between human civilization and our ecosystem through time and space." Williams explains. Conceived with enthusiastic input from NASA, and featuring spectacular imagery simulating Earth as seen from space - as well as visually striking reminders from terra firma of the delicate balance between our planet's miraculous splendor and its fragility - Bella Gaia (Beautiful Earth) has been hailed by euphoric audiences around the world, including many in the scientific community, as a celebration of life. Civilizations need a habitable planet and as the eminent opera singer Beverly Sills once noted, "Art is the signature of civilizations." With this in mind, Bella Gaia showcases the amazing art and cultural heritage of civilizations inhabiting planet Earth through live musical and dance performance on stage and large-scale projected visuals on screen. 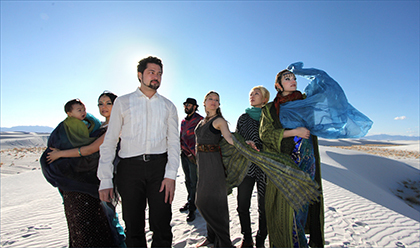 For creator and composer Kenji Williams, the classically trained violinist behind it, Bella Gaia serves as both a culmination of his many years as a visionary musician and composer and an opportunity to impart a critical life or death message through his art. The genesis of Bella Gaia, Williams explains, occurred at the end of 2005, when he was in Kazakhstan to witness the launch of a Soyuz rocket. There Williams met American astronaut Mike Fincke, who had lived on the International Space Station for six months. "I asked him what changed when he went into space," says Williams, "and he told me that before that his favorite planets were Mars, Jupiter and Saturn, but once he went into space and looked out the window of the space station, he completely fell in love with planet Earth, and Earth became his favorite planet. I just got really inspired by this story." It was during that trip that Williams conjured the idea to create a multimedia project that simulated space flight and induced the transformative experience that astronauts have in space. "That was the genesis of Bella Gaia, and we now have real NASA astronauts attesting to Bella Gaia's successful simulation of spaceflight, and its inherent transformative power. Among them are Piers Sellers, a veteran of the Atlantis and Discovery space shuttles, who said, "It is as if you were an astronaut looking down, meditating on human civilization. Bella Gaia is just beautiful. It really felt like I was back in space." 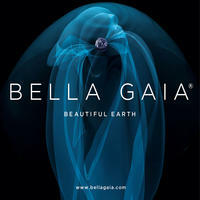 Created in conjunction with NASA, BELLA GAIA has now become a world-renowned, award winning live performance with "breathtaking audio-visual explorations that will transform your view of life on earth" (AZ Weekly) and a "sound that mesmerizes audiences" (Hollywood Progressive). A bridger of music, visual arts, and science, Williams has won international awards from The Canadian Society of Cinematographers, The Sundance Film Festival, and most recently The Macau International Fulldome Film Festival for "Best Soundtrack". Not to mention, he has collaborated with consciousness researcher Deepak Chopra and even had a live televised jam session with International Space Station astronaut, Koichi Wakata. 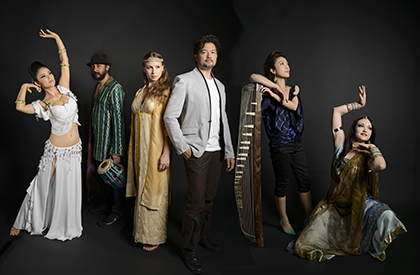 Williams is joined by an all-star cast of musicians on the new album, including Sound Healing artist Kristin Hoffmann, tabla master Deep Singh, and Japanese koto master Yumi Kurosawa. A "deeply moving and shimmering soundscape" (Blog Talk Radio) complete with virtuosic violins, soothing vocals, and exotic instrumentation (koto, tablas, Egyptian nay flute), Bella Gaia takes listeners on a journey to uncharted musical territory with "haunting classical/world fusion music ... creating a mesmerizing spectacle that should not be missed" (Huffington Post). You can also check out Kenji Williams' solo project here on Magnatune. Bella Gaia lives in New York, USA. Tagged as: World, Inspirational, New Age, Vocal, Daydreaming, World Influenced.